This post is a trailer for some very exciting posts at Highbury Grove that will be advertised in January. Readers of this blog will know that we are on a mission. This is a fabulous place to work and I’m looking for some great people to join us on our journey. We’ll be looking for people to start in April 2016 or September 2016 depending on circumstances. All the details will be available via the TES and our vacancies page in due course. 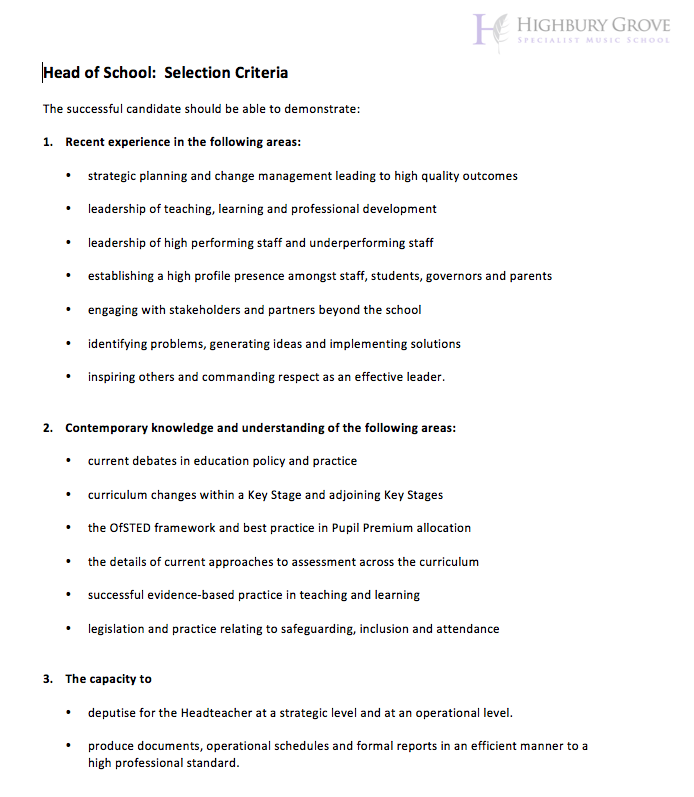 Following a re-structuring of our senior leadership team and the success of one of our Deputy Heads in securing their first Headship, we are looking to recruit two Heads of School; one for Key Stage 3 and one for Key Stage 4. The Head of Sixth Form is already in post. These exciting roles are crucial senior leadership positions designed to drive us towards our ambitious long-term goals. 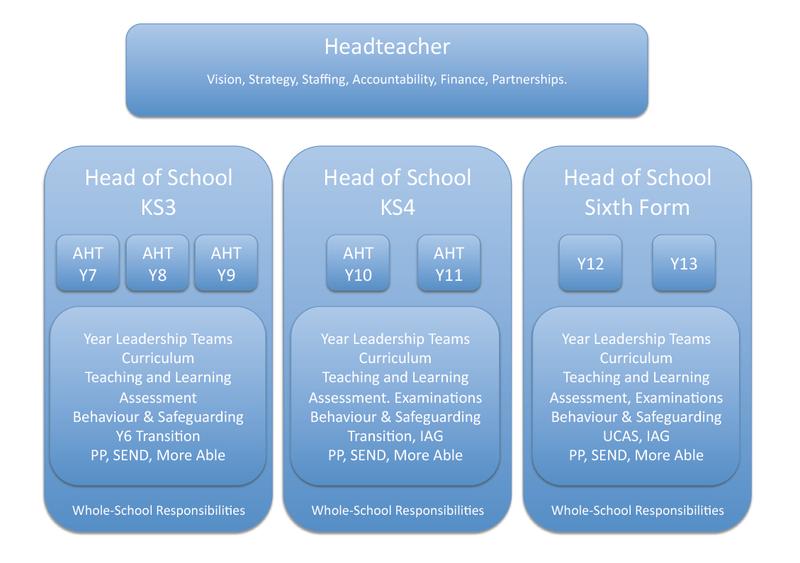 Each Head of School will have oversight of their Key Stage in every detail as outlined below, working with a team of very strong Assistant Heads. The Key Stage ownership will provide the post-holders with the opportunity to develop a wide portfolio of skills and experience; the perfect spring-board to move onto headship. Our new Head of School structure. We also have a Business Manager and seconded Director of Music within the team. The KS4 job is exactly the same in essence – with obvious differences in the detail. We are looking for people with a combination of talent, experience and expertise; solutions-orientated people with a passion for comprehensive education and the energy and drive needed to deliver on an ambitious agenda. We are explicitly trying to build a high-trust professional culture and need leaders who can work in that spirit whilst also securing accountability for student outcomes in every area of school life. It is a high-challenge/high-reward environment; we need leaders who have the skills to inspire and lead staff members at every career stage, supporting them to operate at the highest level they can. Is this you? If so, we’d like to hear from you. Our current Head of Maths has decided that, after serving in the role for ten years, she would now like to focus on doing what she loves the most – teaching – and will be stepping down from September. This presents a superb opportunity for a talented Maths teacher to join us to lead a wonderful team of enthusiastic and committed teachers. We have a strong and growing Sixth Form with excellent ALPS outcomes and a rising profile of projected outcomes from 2016 onwards. We are looking for someone with experience of working in a highly successful department, teaching students across the full ability range, with the confidence, pedagogical know-how and belief needed to lead every student to success in Maths. It’s a golden opportunity to make a very significant impact for a person of the right calibre. If you are interested, please get in touch. Our SENCo has moved out of London leaving a vacancy for someone to join a vibrant Learning Support team. Working with the Head of Learning Support, the EAL team and a team of LSAs, the SENCo role is at the heart of what makes Highbury Grove the inclusive school that it is. We have over 25 students with statements including some with physical, visual and auditory impairments, autistic spectrum disorders and a range of other specific learning needs. We are co-located with Samuel Rhodes special school which offers opportunities for collaboration and joint-CPD. We are looking for someone who will support our view that inclusion means high expectations for everyone and can bring knowledge and experience to the team. Please get in touch so you can find out more. Please leave your details below if you would like further information, stating the position(s) you are interested in. 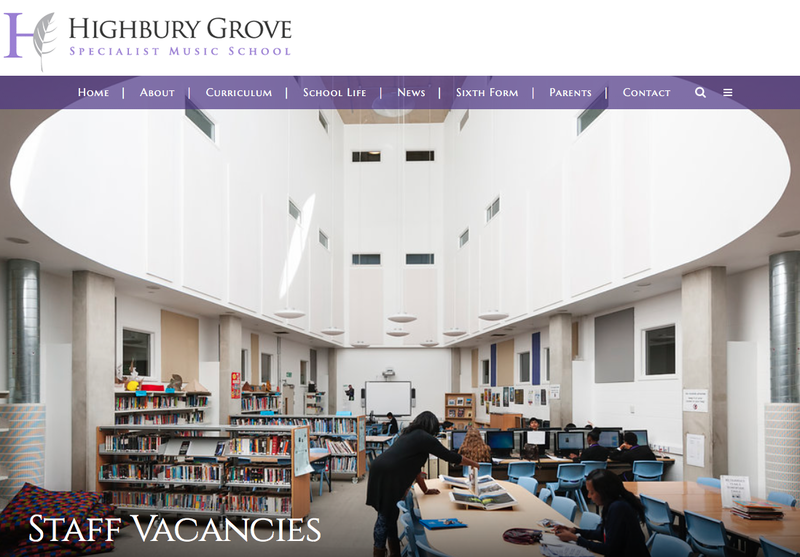 Take a look at our website to get a feel for the school: www.highburygrove.islington.sch.uk. You will also find out a lot more by reading other posts in this blog. « Highbury Fields in 2015. A Year of Trees.